Fancy a Monday morning quickie?!! You've given me such lovely feedback on my round cushion tutorial, thank you so much. One thing I should like to point out is that that pattern is for half trebles (half doubles US) so it won't work properly if you're fancying crocheting a circle using treble (double US) stitches. Here is my little tutorial for crocheting a circle using trebles (doubles US). 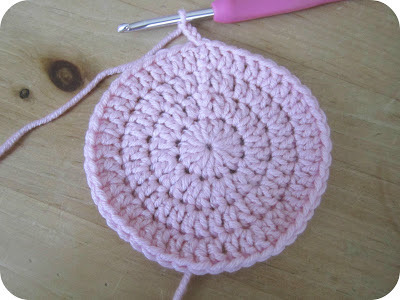 It can be a bit of a pain getting your crocheted circle to lie flat. Lots of people (including me) have ended up with a frilly pancake more than once. The important thing to remember is that if you start with 12 trebles in your round, you should be increasing each round by 12 stitches. Not more, not less. Your circle will always sit flat if you follow that general rule. Work 12 trebles into the third chain from the hook. Slip stitch into the first treble to close the circle. You should have 12 trebles in your circle. Count them. 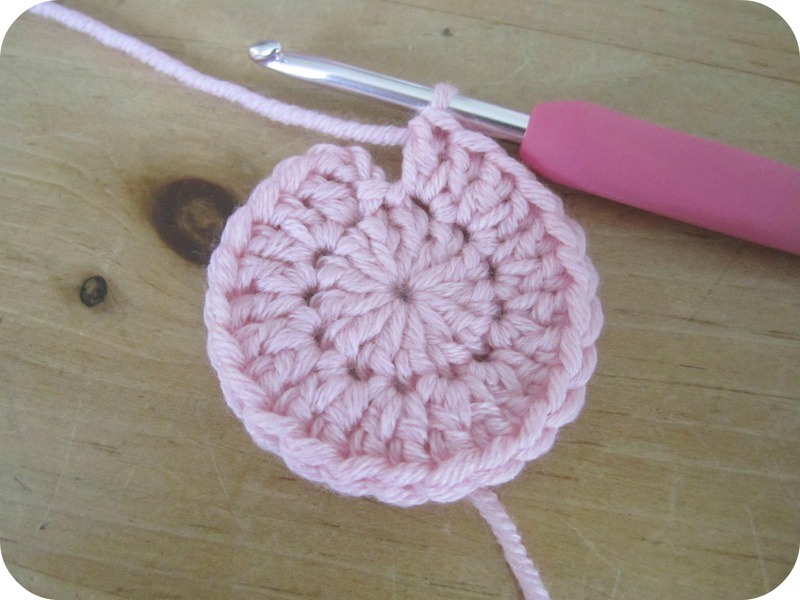 Chain 3 and work a treble into the same stitch. 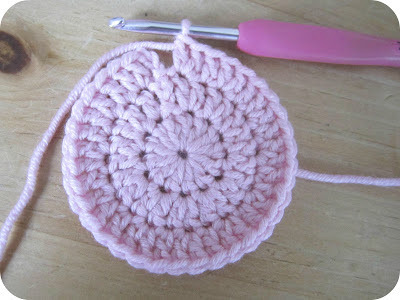 Work two trebles into each of the rest of the stitches in the round. You should now have 24 stitches in your round. 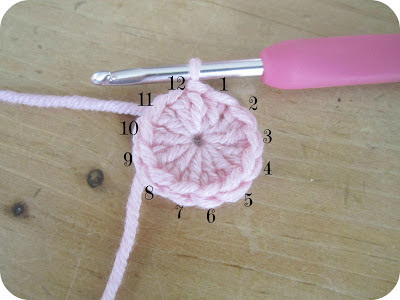 Do please note we are including the chain 3 at the beginning of the round as a stitch. Because we are slip stitching into it and chaining 3 from it in the following round, it is important to include it when you're counting. 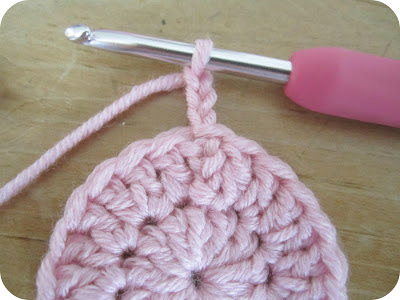 Now, slip stitch into the 3rd chain of the beginning chain 3 to close the round. *Two trebles into the next stitch. Repeat ** until the last stitch in the round which should have two trebles in it. You should have 36 stitches in your round. Slip stitch into the 3rd chain of the beginning chain 3 to close the round. One treble into the next stitch. Two trebles into the next stitch. *One treble into the next two stitches. You should have 48 stitches in your round. One treble into the next two stitches. *One treble into the next three stitches. You should have 60 stitches in your round. One treble into the next three stitches. *One treble into the next four stitches. You should have 72 stitches in your round. One treble into the next four stitches. *One treble into the next five stitches. You should have 84 stitches in your round. One treble into the next five stitches. *One treble into the next six stitches. You should have 96 stitches in your round. You should be noticing a bit of a pattern now. 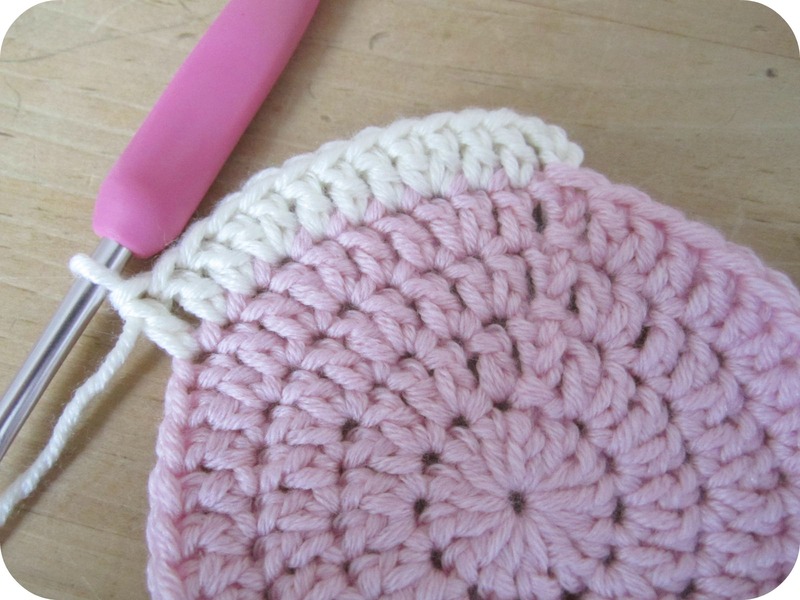 As your circle gets bigger, it will obviously become more and more of a faff to keep counting the number of stitches at the end of each round. Follow this rule and you won't have to ... always makes sure you are working an increase (ie. two trebles into one stitch) into an increase of the previous round. In any one round there should always be just twelve stitches which have two trebles worked into them. No more, no less. Just as a little extra, you may have noticed I changed colours part way through the tutorial. The way I join a new colour is half way through the slip stitch at the end of the round. Insert your hook into the third chain of the beginning chain 3 and pull a loop of your NEW colour through. Continue as normal. There you go. I've got brainache now (!) but I do hope that helps. Frilly pancakes should, hopefully, be a thing of the past!!! Do feel free to let me know how you get on or if you get stuck. Great blog , thank you so much for sharing,have a nice week.love your blog. 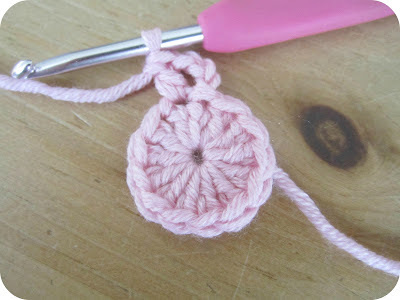 I love, love, love crochet tutorials. Thank you SO much for taking the time. Very helpful!! It seems so simple when you put it like that - thanks! 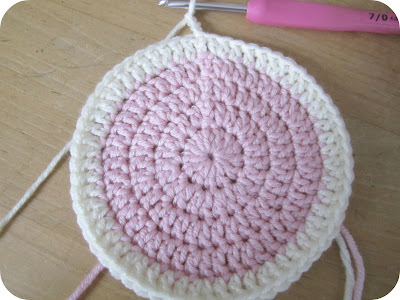 Will keep in mind when I eventually get round to making a round cushion! Funnily enough, I made a frilly pancake yesterday before working out where I was going wrong. Wish I'd looked for your post before I started! Your crochet is always so beautifully neat and perfect, Heather! 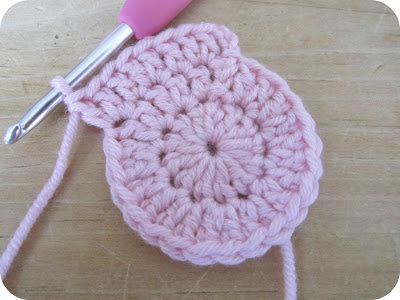 This tutorial is wonderful...I will be saving it too! Thank you so much for this! I am just getting the hang of crochet but haven't been able to find a clear tutorial. This is just what I needed! This is a great tutorial! Super clear and succinct. Would you be interested in posting some technical advice, or even just pictures, on Kollabora, the crafting and DIY community I'm part of? 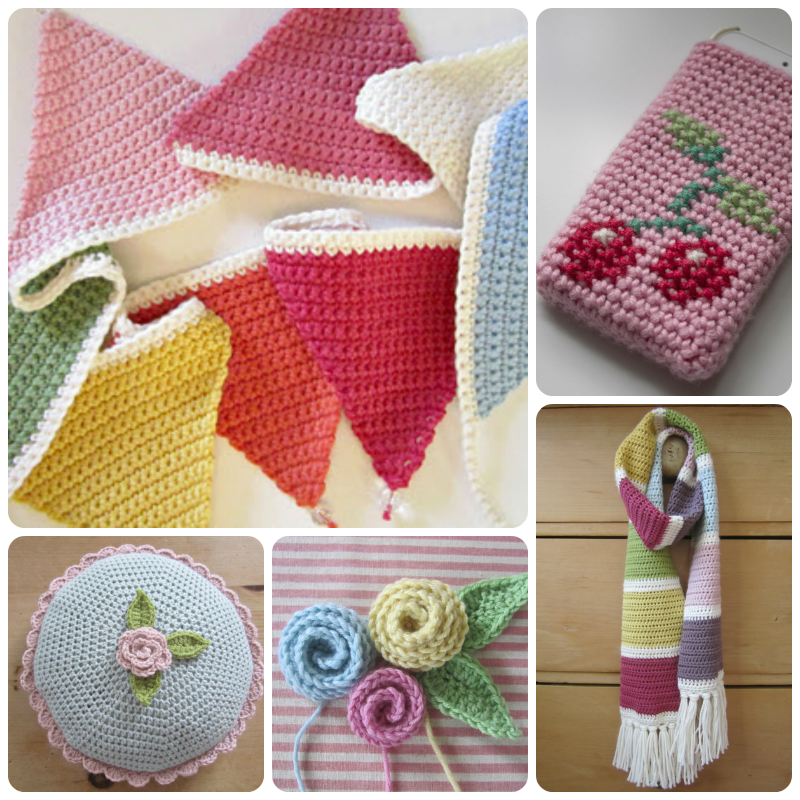 I'm trying to get some of the other members into crocheting because there aren't many crocheters on the site as yet.